Indian shuttler Ajay Jayaram’s quest for a hattrick at the Dutch Open ended in despair as he went down fighting in the final of this Grand Prix tournament at Almere, Netherlands on Sunday. The top seed, who looked out of sorts in the beginning, made an impressive turnaround mid-way through the match only to see his efforts going in vain in a narrow 10-21, 21-17, 18-21 loss to the second seed Tzu Wei Wang. 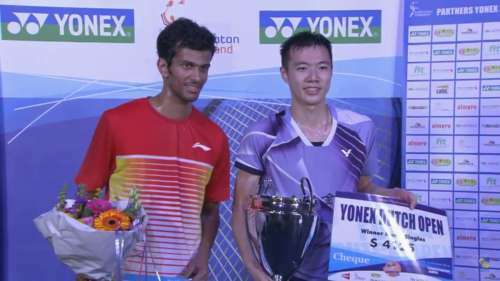 Jayaram has had great memories at this event which remains the most successful tournament of his career. He won it the last two years and had even reached the final once earlier in 2010. This is his first loss to the Chinese Taipei shuttler after winning their two previous showdowns in straight games. The top seed did not have the start he was expecting to have. He looked sluggish and also a bit jaded in the initial stages. In contrast, Wang looked fiery and was attacking right from the word go. He opened up a 4-0 lead which he calmly maintained throughout the game without any hassle. From 11-5 at the mid-game interval, the aggressive Wang inched ahead 16-9 before finishing the game at 21-10. The first half of the second game then turned out to be very close. Each player kept on oscillating between brilliant points and unforced errors and they remained locked till 9-9. It was Jayaram who broke away from the tie thereafter. He built a solid lead of 15-10 and extended it to 17-11. Even though Wang did reduce the gap, he was unable to stop Jayaram from taking the game 21-17. Shaking off the setback, Wang then quickly settled into the decider and surged to 6-1 and then 10-5. Jayaram did manage to make a brief comeback, though, by injecting more power and pace into his shots. But from 16-17, his game was not effective anymore as he gifted the last few points to the Chinese Taipei shuttler with the Indian’s return finding the net on match point.